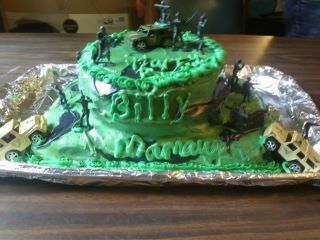 I made this Military Cake for a birthday celebration for my mother and my son. Both of their birthdays fall on the same day, but the decorating was specifically chosen to please my son. This was my first attempt at designing a cake and this is how I did it. I made a rectangular chocolate cake for the bottom, and 2 (8 inch) rounds out of yellow cake mix to stack on top. My icing is 1 1/2 containers of the whipped Vanilla. I divided the icing and dyed some a lighter green (need more of this than others), some a darker green, and some black (to make camouflage design). I placed the rectangle cake on the bottom and covered it in light green icing. Then I placed one 8 inch cake on top in the center of the rectangle and used white icing on top and then placed the other 8 inch cake over top of that. Next, I iced the round cakes with light green and then went back with the darker green and black and in random places to give the camo appearance. I had purchased some army men from the dollar marts and army hummers from Wal-mart (Note: Wal-mart has both). I used these items to decorate the cake to form a military scene. Finally, I bought some of the spray icing in green and went around the edges and used it to write Happy Birthday. My son loved this cake, and believe it or not, so did my mom! You did a great job for a first attempt at cake decorating! I love the army themed birthday cake idea, but I love even more that your mom was happy to have a military themed birthday cake knowing how much her grandson would love it. That reminds me so much of my own sweet mother who is with the Lord now. She adored her grandkids so much and was always making life more special for them. Thanks so much for sharing this masterpiece cake with us, and I do hope this will just be the first of many that you create and add here in the future.